Unique opportunity to own a business across from historic Nela Park. The building & business are being sold together. All liquor & vendor licenses will transfer with the sale. Currently there is a hair dresser who rents one of the spaces. 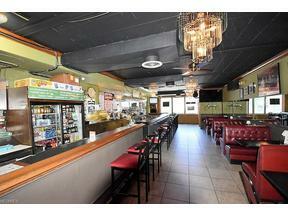 This also a restaurant bar, and a fully furnished party facility. All of the bar & party center kitchen & dining equipment stay with the businesses. The party center has a 2000 square foot room, with a full kitchen that is approximately 1800 square feet. There is also a smaller dining room for smaller gathering. Handy cap accessed bathroom, along with women/men's facilities. There are currently reservations for into 2019! Also included is a back parking area. Additionally, a secondary parking area is included in the sale. There are four total addresses for this parcel. 1986,1988,1994 Noble are apart of this sale. For more details and specifics, call! This is a Money Maker...Seller wants to retire...andhe will train new owner if desired.